Price and I made mushroom risotto last night. It was the first time I ever made risotto. It took so much longer than the recipe said it would but it was worth it because it was so good. I’m now determined to make lots and lots of risotto. I pulled out my Martha Stewart Classics Cookbook and got to work. It was really easy to prepare, I just had no idea how many pots/dishes it would use… 1 large to cook risotto, 1 pot for broth, cutting board, 2 bowls for prep, wooden spoon, and bowls for eating. I was hoping around grabbing different bowls and things but now I’ll be better prepared next time. We have an electric glass stove top so I had to continually play around with the heat because 1 min it was hot and the broth was getting incorporated quickly and then the next it was taking its sweet time. Oh I wish to have a nice gas range one day. Plus i think I was a bit nervous in doing this since I have the tendency to cook things on a higher temp that what is called for so I overcompensated this time and the cooking part took about 40 minutes instead of 25-30. Heat stock in pan over medium heat. 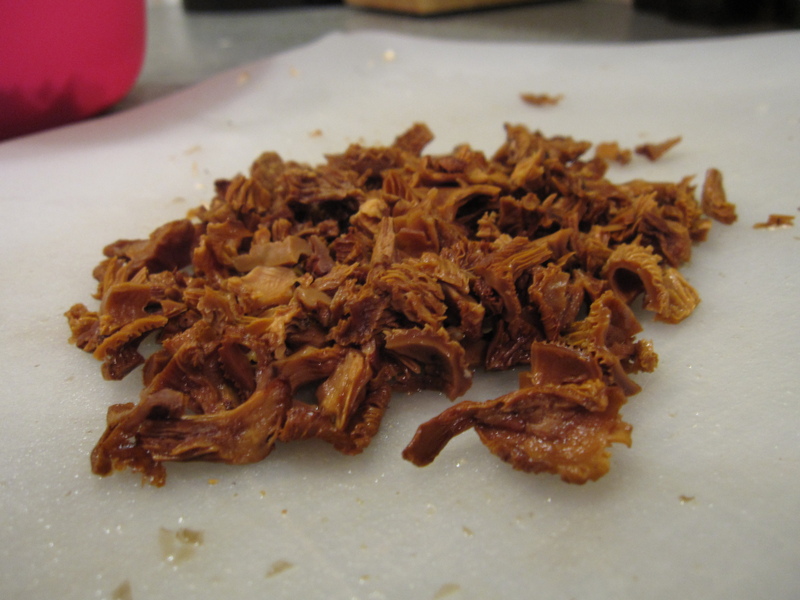 Add dried mushrooms; cook until tender, about 5 minutes. Remove with slotted spoon; chop finely. Keep stock at a simmer over medium heat. Remove stems from fresh mushrooms; chop finely. Slice caps 1/4 inch thick. Heat 1 tablespoon oil in heavy-bottomed saucepan over medium heat. Add mushroom caps; cook, stirring occasionally, until golden and soft, about 3 minutes. Transfer to bowl. To pan, add remaining 6 tablespoons oil, mushroom stems, and shallots. Cook, stirring, until translucent. Add rice; cook, stirring, until rice begins to sound like glass beads, 3 to 4 minutes. Add wine. Cook, stirring, until wine is absorbed by rice. Using a ladle, add 3/4 cup hot stock to rice. Using a wooden spoon, stir rice constantly, at a moderate speed. When rice has absorbed most but not all of liquid and mixture is just thick enough to leave a clear wake behind the spoon when stirring, add another 3/4 cup stock. 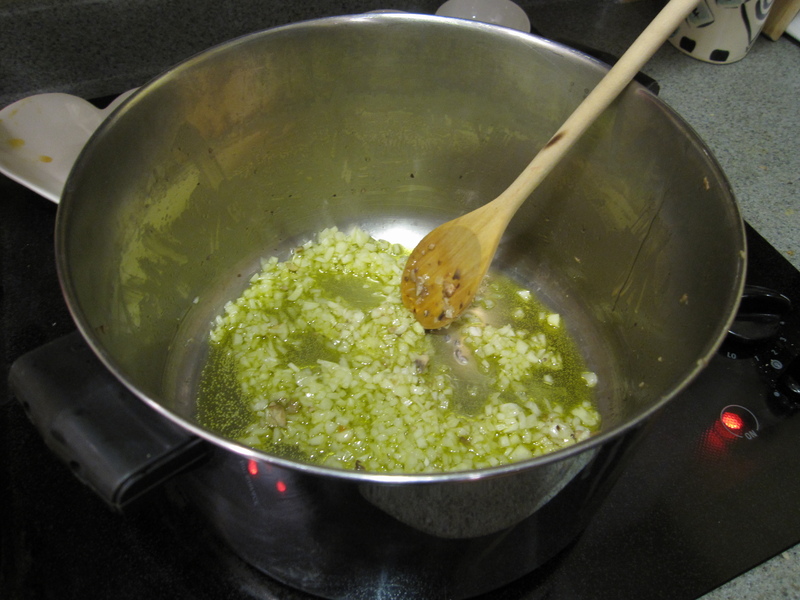 Continue adding stock in this manner, stirring constantly, until rice is mostly translucent but still opaque in center. Continue cooking until rice is al dente, but not crunchy. 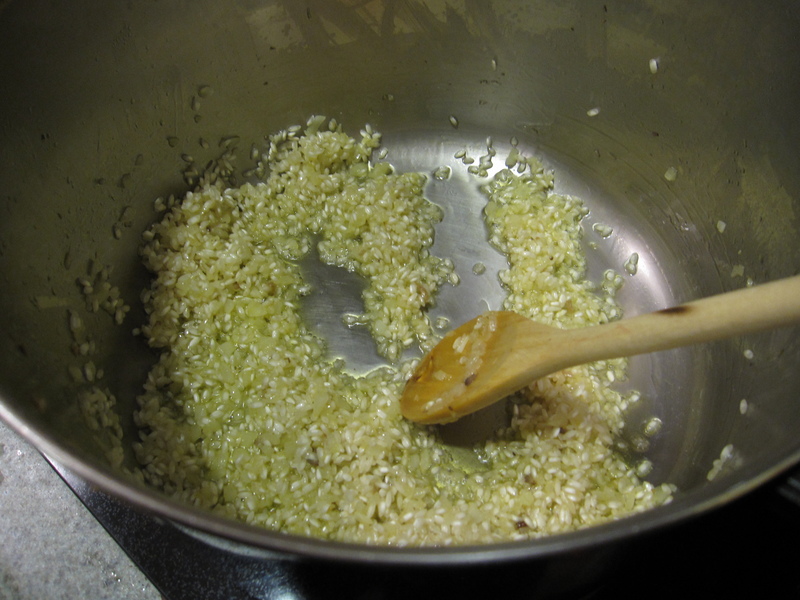 As rice nears doneness, watch carefully; add smaller amounts of liquid. The mixture should be thick enough that grains are suspended in liquid the consistency of heavy cream. 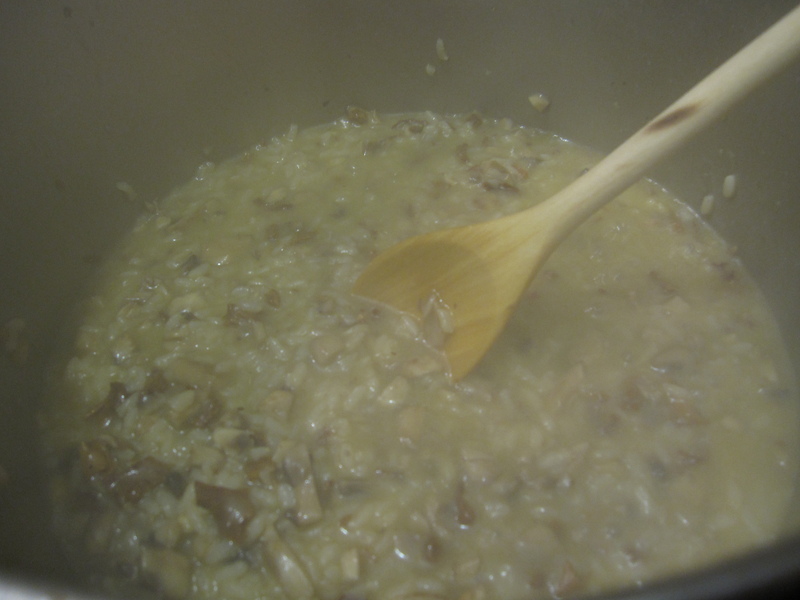 The risotto will thicken slightly when removed from heat. Add dried mushrooms and mushroom caps; warm over low heat. Remove from heat. Stir in butter and Parmesan; season with salt and pepper. 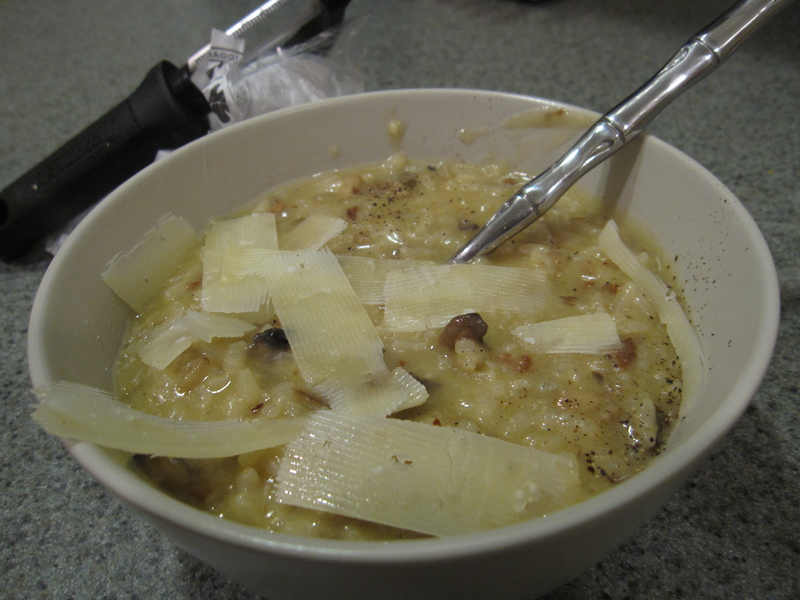 Divide among four bowls; grate Parmesan over risotto. Serve immediately. Almost done.. sorry for the crap photo, there was so much steam! All done! I shaved some parm on the top. The photos are horrible! So sorry about that. The risotto looked so much better in real life. Plus it smelled and tasted great. I thought the process was easy and the result was great. I think I am going to try butternut squash risotto next. I really was surprised how much oil and butter were in the recipe. I have to see about cutting that back because 1/4 cup of oil is a lot! I love mushroom risotto. There is a very expensive restaurant in Tampa (Bern’s Steak House) that serves a killer mushroom risotto that any time I go there (not too often) I always ask if I can sub the risotto for the baked potato. They are always so happy to comply. It is so good.